Little Mrs. Married: NaBloPoMo!! Heehee! I'm so excited! 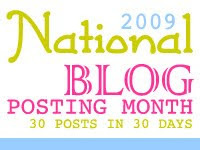 I just found out from Nicolasa at Low Expectations that November is National Blog Posting Month! It is a challenge to write 30 blog entries in 30 days! Oh, i SO can do this! The challenge for me will be to NOT write multiple entries on one day (i mean- if i have an idea for a blog, shouldn't i save it for a day in November that i have no clue what to write?!) The only time i think might be a challenge to blog is when we go on vacation in 2 weeks, or when we go to my grandparents for Thanksgiving. But i am going to do it!! I am really excited about November. I think my mood has improved dramatically when i realized November was almost here! November 1 - January 1 is my favorite time of year! YAY!! (1) Seeing Arsenic & Old Lace at BRLT! A few of my friends are in it! (2) Stage Managing The Elephant Man. Rehearsals don't start till December, but auditions are this weekend! Can't wait! (3) OUR ANNIVERSARY VACATION!!!!!!!!!! I am SO excited!! Hubby & i are celebrating our first anniversary on the 14th! We are going to San Antonio, Texas & i am SUPER excited! okay, I need help with the whole blogging thing - I'm a noobie at it. How do you get your layout??? The different posts to the right, big pic at top, etc.??? Yaay! I am glad you're joining in, too! I love this time of year too! It is so much fun! Have fun in San Antonio, the whole area is so beautiful!